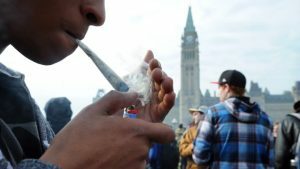 Canadians counted down to marijuana legalization day yesterday as if it were New Year’s Eve, and then lined up around the block as if it were Black Friday to buy weed the next morning. 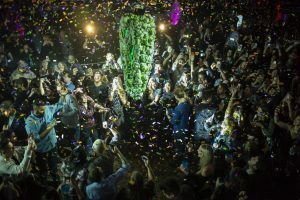 “Just because they arrived at 3:30 in the morning, don’t assume Montreal’s first legal buyers of marijuana are stoners — call them history enthusiasts,” writes Selena Ross for the Washington Post. 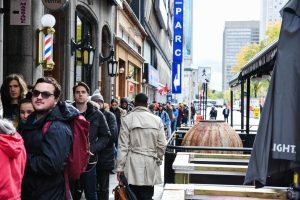 Hundreds of customers lined up around the block for the grand opening of one of three new marijuana shops in Montreal. 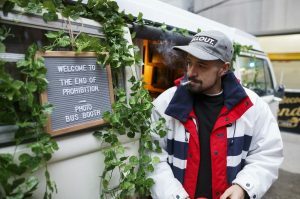 A loud cheer filled the city streets as the doors opened at 10 a.m.
A resident smokes a joint while exiting a photo booth during a “Wake ‘N Bake” event in Toronto on Wednesday. Canada passed The Cannabis Act with a landslide vote in the Senate last June. It was the second country in the world, after Uruguay, to legalize recreational marijuana. Canadians are now allowed to buy, grow and consume cannabis legally as early as this September. Citizens over age 18 can now buy cannabis and cannabis oil grown by licensed producers at various retail locations, or order the drug online from federally licensed producers. They can grow up to four plants at home for personal use. Adults are allowed to possess up to an ounce of dried cannabis in public and smoke in public in some provinces. In Ontario, citizens can smoke cannabis wherever they can smoke tobacco. Edibles will not be immediately available for purchase, but will be within a year. Some are wondering whether the U.S. or the U.K. will be next. “Canada’s progress will galvanize support for drug policy reforms around the world,” Hannah Hetzer of the Drug Policy Alliance told Rolling Stone. Trump has sent mixed signals on pot, recently saying he’ll “probably” back legislation to safeguard pot-legal states like Colorado. A recent poll finds more than two thirds of American voters support full legalization. The UK government said recently it would review the use of medicinal cannabis. Medical marijuana is legal in 14 European countries, Israel, Argentina, Puerto Rico, Panama, Mexico, Turkey, Zambia, Zimbabwe, and 29 U.S. states. Nine of those states have legalized recreational marijuana, as well.